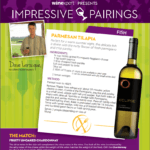 The first in Winexpert’s “Impressive Pairings”, Parmesan Tilapia with Eclipse Sonoma Dry Creek Chardonnay! Remove Tilapia from refrigerator about 20 minutes before placing in oven. Combine the Parmigiano, paprika and parsley in a small bowl; season with salt and pepper. Rub both sides of tilapia with olive oil. Sprinkle or dredge with Parmigiano, paprika and parsley mixture to evenly coat. Place on lightly oiled foil lined baking sheet. Serve with lemon wedge, wild rice and toasted almond slices, and buttered green beans or fresh spring peas.